If you've ever dreamed of seeing yourself on the cover of a magazine--or remember posing for a mock cover as a kid--you could score the real deal next month. 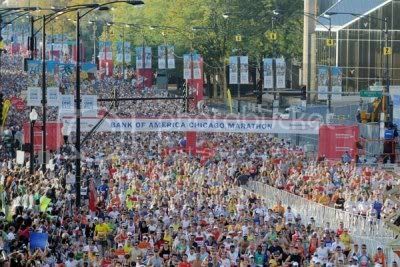 Time Out Chicago has announced a contest for those running the Bank of America Chicago Marathon on October 11 that could place one lucky runner on the cover of the magazine's October 8 issue. Just imagine the notoreity of landing in mailboxes, bookstores and drugstores, and on newsstands around the city. Or how you could stick it to any friends, family or co-workers who doubted your seriousness in running a marathon. But you only have until noon on Tuesday, September 22, to convince Time Out Chicago that you're the one they want to photograph for the cover. To enter the contest, e-mail sports@timeoutchicago.com with your name, a picture of yourself and a few details about your marathon training. TOC will select a winner and photograph that runner to the cover. That's something to race for as taper time sets in.